Parts: 9 resin. You also need parts from the Polar Lights Enterprise kit. Molding Quality: 8 - well cast. Very minor sanding needed to clean up mold seams. Detail: 8 - looks good to me. When Polar Lights announced that they would be releasing a new Enterprise kit, it was great news for Sci-Fi modelers. Once we got our hands on the Enterprise kit and saw how great it was, the kitbashing began. Now we can also convert our Enterprises into Detroyat heavy destroyers with the Starship Modeler Kit Factory's sweet little conversion kit. 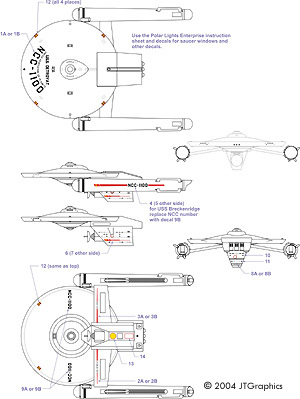 The Detroyat was included in the fan-produced Ships of the Star Fleet vol. 1. While I have not seen that book, it is a unique design. The conversion kit was sculpted by Planet V and consists of 9 parts cast in a light blue resin by Controlled Energy Designs. The casting is very well done with just minor mold pour stubs on a few of the parts. The biggest part of the conversion is the boxy secondary hull. The two parts that make up the secondary hull were engineered really well. A test fit of the parts shows how well the resin parts conform to the Enterprise kit parts. The warp nacelle pylons are also very well cast and fit into the secondary hull quite easily. A small note included with the kit advises the modeler to use Epoxy for joining the Pylons to the hull. This is a nice touch as some people may have just used CA glue. The main deflector mount fits nicely on the front of the secondary hull. The conversion kit also includes 4 phaser banks three are mounted on top of the saucer and the fourth underneath. JTGraphics did the decals included with the kit and like all their decals they are great. The sheet includes markings for two ships, the U.S.S. Detroyat and the U.S.S. Breckenridge. Also included are windows for the secondary hull, RCS thrusters, and hatch covers. The instruction guide consists of four pages of assembly instructions and one page of color decal placement instructions. The instruction guide is well done, and will make the construction process much easier. A template for the placement of the phaser banks is also in the instructions. I'm impressed with the Conversion kit. It is very well engineered, sculpted and cast. It builds into a very unique subject, and should look nice when complete. 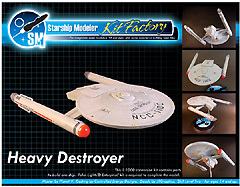 It is also very reasonably priced, at $25.00 for the conversion plus $9.00 for Polar Lights Enterprise kit you get a unique model for less than $40.00 - which for a conversion is really good. I like this kit and I recommend that everyone get one. Many thanks to Scott's wallet for providing the review samples. Manufacturers and retailers, interested in getting your wares reviewed and publicized on a site averaging 3500+ readers a day? Contact us! This page copyright © 2004 Starship Modeler. First posted on 8 July 2004. Last updated on 25 October 2004.